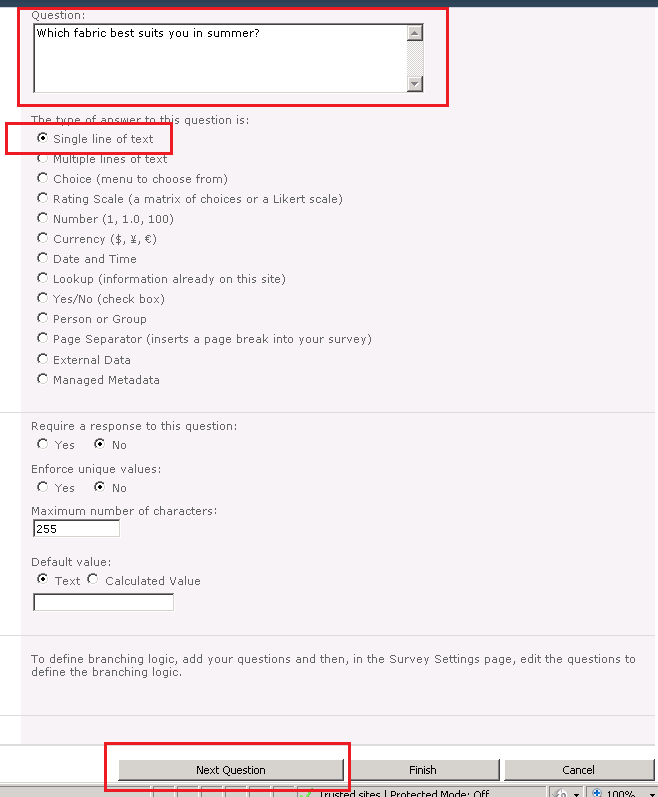 Creating surveys and recording response in SharePoint is a very useful feature of any intranet or internet facing site. Surveys can be recorded periodically every quarter or monthly based on organizations. This blog post shows how to create a survey and record responses from the audiences. 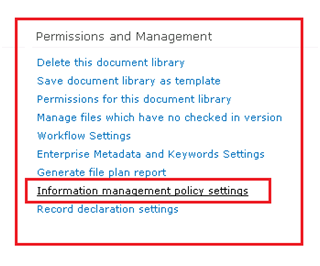 You must log on to your SharePoint site with admin rights. 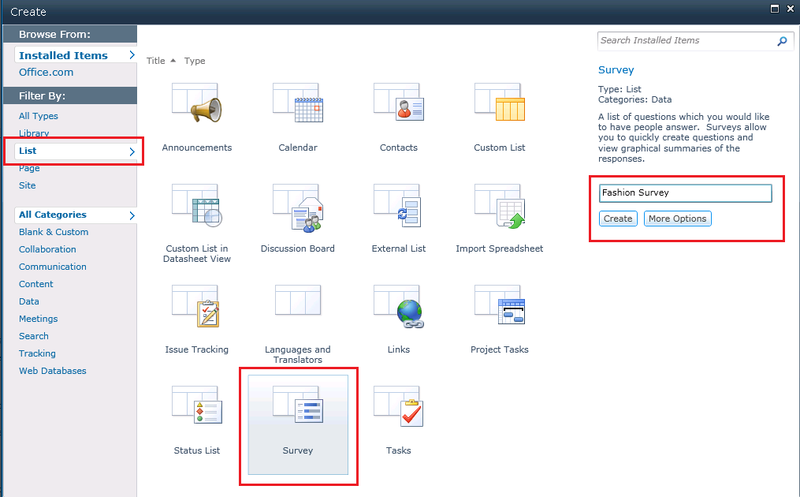 Enter the name of your survey and click on Create. Now that our list is created, it’s time to enter the questions for the survey. Enter your question and click on Next Question until you finish entering all your questions one by one. While filling in the questions, you can select the field type for each question and proceed. You can also branch your users according to their responses, how to do that, we will see later in this post. Now that you have finished entering all your questions, you should click on Finish which will take you to the list settings page where you can see all your questions listed. Now, you can click on the question you want to put branching on and enter the branching criteria. Finally when all this is done, you are good to test your survey. Click on the survey list from the left hand navigation which will take you to the survey list. Click on Respond to survey for filling in the answer to the questions and submit your survey. Now, if you want the audiences to have only the survey submission rights and they should not be able to view what others are submitting, restrict access to the library accordingly. Follow the steps below once you have Created your Record Center. If you want to see how to Create Record Center, Click here. Ensure that you have the required permissions to perform this procedure. To create a connection, you must be a member of the Farm Administrators group. 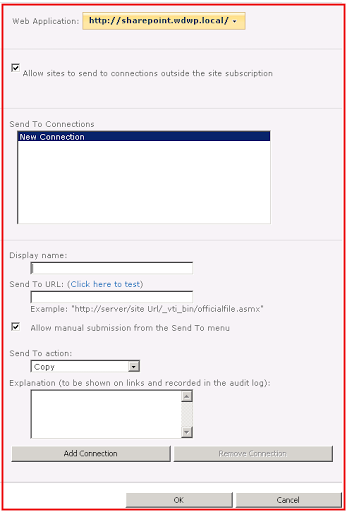 Go to SharePoint Central Administration, under General Application Settings, click Configure Send To Connections. In the Web Application field of the Configure Send To Connections page, select the Web application that hosts the site collections from which documents will be sent. From the Send To Connections list, select New Connection. In the Display name field, type a name for this connection. This is the name that users will see as one of the options to which to send a document. In the Send to URL field, enter the URL which we copied in the initial steps. Click “Click here to test” if you want to confirm that you have entered a URL to a Content Organizer. This should bring you up the web service that transfers the document from source to destination. To display this connection in the list that appears when a user clicks Send To, select Allow manual submission from the Send To menu. 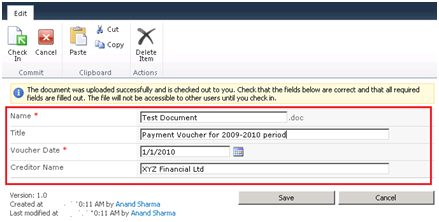 Copy: Select this option to create a copy of the document and send the copy to the destination repository. Move: Select this option to delete the document from its current location and move the document to the destination repository. Users will no longer be able to access the document from its original location. 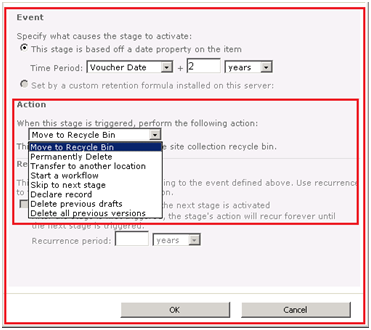 Move and Leave a Link: Select this option to delete the document from its current location, move it to the destination repository, and leave a link at the current location indicating that the document has been moved. When a user clicks this link, a page will appear that displays the URL of the document and the document’s metadata. In the Explanation dialog box, type the information to be added to the audit log when the user sends a document by using this connection. If you selected Move and Leave a Link in the previous step, the page that appears when the user clicks the link will also display the explanation. Click Add Connection to create the connection. Records Management is one of the very important aspects of SharePoint 2010 along with document management. Retention can be set either on content types or on folders depending on business case. 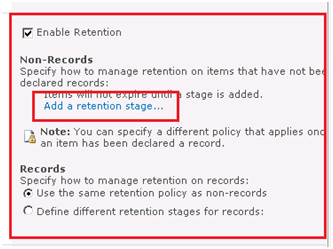 In this post, I will explain how to set retention on any SharePoint library. To start with applying retention to your library items, let us create a content type and then we will apply the retention to the content type which will drive the documents throughout their life cycle. Now that we have our content type ready, document is in the library with valid value in the metadata field, we can proceed to apply retention to the content type. Step 2: You can see the Vouchers content type listed along with the by default Folder content type. Click on Vouchers content type. Step 4: To trigger off the retention, our custom column (Voucher Date) which we added while creating the content type will be listed here. Select Voucher Date from dropdown and put 2 years (for the sake of this post). This is where you will put in your business case and fill in the value you want. Step 5: Once we selected the Voucher Date and entered the number of years, now it’s time to select the kind of action we would want to perform on the item. The Action dropdown will list the available actions to choose from. Let us declare the item as record after 2 years (for sake of this post). 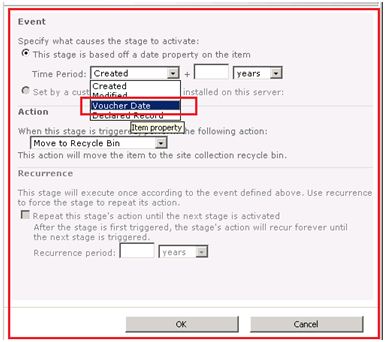 Select Declare Record and click on OK.
Now you will be directed to the previous page with your event described as below. 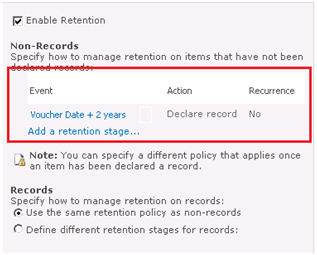 If you want you can add another stage of retention based on your organisation policy. For example, you would want to delete the item after keeping it for another 5 years after you have declared as a record. So you can add another stage here. Also, you may want to send the record to Record Centre after certain period, you can add that here by adding a new stage. And we are done. We have now successfully applied retention to our content type. You can follow the similar way to apply retention to any folder; the process is exactly the same, so I am not mentioning it in my post. The SharePoint job which works in background to make the retention work is Information management policy job and Expiration policy job. They can be scheduled as per your organization policy going into the Central Administration > Monitoring > Review job definitions (under Timer jobs). 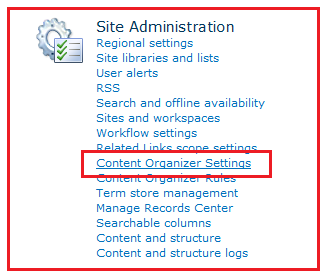 Content Management is an integral part of SharePoint 2010. It helps organize your documents, items and records in a way you have control over its life cycle. We can define what fields we want to use in content types and their data types. Also we can apply validations on the fields within a content type. This blog post describes creation of a custom content type within the site collection and using it within the document library. Step 1:Create a content type “Vouchers” with some metadata columns. Go to Site Settings > Site Content Types (under Galleries) > Create. Step 2:Create two additional columns within the content type. 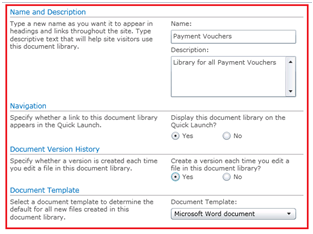 Step 3:Create a document library named “Payment Vouchers”. Step 4:Enable use of Content types within the library. Go to Library Settings > Advanced Settings (Under General Settings) and select Yes for Content Types. Step 5:Add our custom content type to this library. 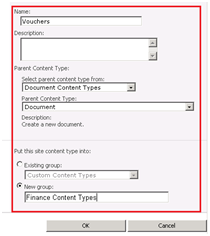 Click on Add from existing site content types and select our newly created content type “Vouchers” from the list and click Add. Also, I will remove the Documentcontent type available in this library by default to avoid any confusion. Step 6:Now we can upload some documents to this library. Click on Upload Documents and browse your file to upload. Once the upload is done, you will be asked to fill in the metadata for our content type Vouchers. If you note, we made Voucher Date as mandatory, which is marked as a red asterisk. After filling in proper metadata, click on Save to complete the upload. Content types can be very helpful when you have thousands of documents in the same library and you have many types of documents in it, so creating separate content types for them and saving them under their appropriate values with their respective metadata values can be very helpful within the organization. Also, content types are very useful when you have a similar kind of documents within your site in different libraries, so you can create a content type and re use it in all the libraries. Implementation of Retention schedules also is one key benefit of using own custom content types.